Nissan Leaf is one of the best and most popular electric models in its range, offers a practical, reliable, affordable and eco-friendly drive. Leaf is a 100% electric vehicle that emits absolutely no CO2. "Nissan Leaf is the best-selling electric car in Europe for the fourth year in a row." Nissan Leaf is powered by lithium-ion batteries which are more durable than lead acid batteries. These are underneath the floor of the car, allowing you to get as far as 114 miles on one charge. Leaf is capable of reaching 0 to 62 mph in just 11.9 seconds. The Leaf is offered with four trim levels - Visia, Visia+, Acenta and Tekna. All models come with front fog lamps, LED tail lights and Bluetooth connectivity as standard. While the 'Acenta' model gets a seven-inch touch colour screen and cruise control. It also has a feature that enhances the amount of energy recovered from the car's braking system and used to top up the batteries. The Leaf has recently achieved five star crash safety ratings from Euro NCAP as it features a generous array of safety equipment including stability and traction control, six airbags and rear-view camera for easy and safe parking. Leaf could be a replacement for many petrol-powered run-arounds and would become your favourite family car due to its excellent practicality, well-equipped cabin and upmarket interior. The biggest selling point of this vehicle is its zero emissions potential and ability to slash your car running costs. The Nissan Leaf is one of the best, fun and comfortable electric vehicles available in the market and our leasing option makes it even more affordable. 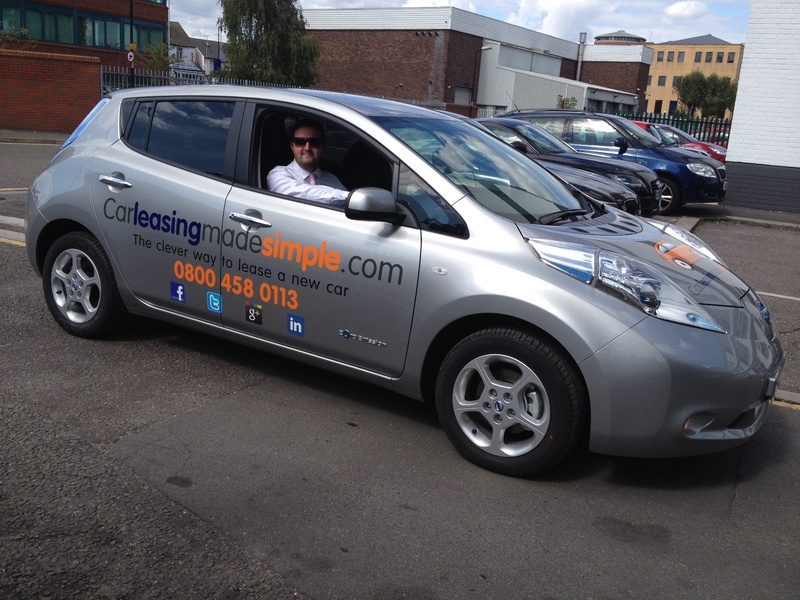 Since the Leaf arrived in UK, it has become our favourite electric vehicle and that's why our Procurement Director has chosen the Nissan Leaf as our company branded car. Leasing a Nissan Leaf can be easy as pie. When you get yourself behind the wheel and save thousands of pounds on fuel, London congestion charge and road tax you'll be loving the Leaf as much as we are! Getting a Nissan Leaf on lease is a fantastic alternative to buying a brand new car - with a low initial payment, fixed monthly installments and flexible contract terms. We have a strong relationship with our dealers, offering a vast range of Nissan Leaf deals at extremely competitive lease rates on both business and personal contract hire. So whether you need a business or personal lease - you will find the best Nissan Leaf deals on our website or alternatively call our sales team on 0800 458 0113 !! !